New Apple AirPods launch with improved battery and H1 chip | What Hi-Fi? Apple kick-started the trend for true wireless headphones and now the tech giant has launched its eagerly awaited second generation Apple AirPods. The headline features are enhanced battery life, a wireless charging case and the ability to go hands-free with Siri. It's also out with the old W1 chip and in with a brand new H1 chip which makes its debut in the 2019 AirPods. Like its predecessor, the H1 uses optical sensors and motion accelerometers to detect when you're wearing the AirPods and when you're only using one. There's also a extra speech-detecting accelerometer which works with beamforming mics inside the AirPods to help remove external noise and make your voice clearer. Talk time is up to 50 per cent longer than the first-gen Apple AirPods (from two hours to three). You should also get five hours of listening from a single charge and 24 hours when you factor in the charging case, although the fine print does say Apple's testing was done at half volume. If you enjoy cranking your tunes up, those figures could vary. A 15-minute charge from the case should be enough for three hours of listening, which will probably cover your commute home. 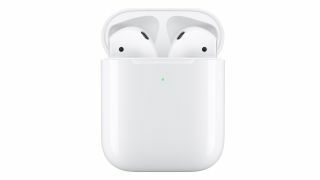 The second generation 2019 AirPods with wireless charging case cost £199/$199, while you can also buy the new AirPods with the standard charging case for £159/$159. If you just want the new charging case for an old pair of AirPods it can be yours for £79/$79. Both versions of the 2019 AirPods are on sale now. Let's just hope they sound better than the recently launched Samsung Galaxy Buds.